U.S. military jet investigates a friendly UFO. 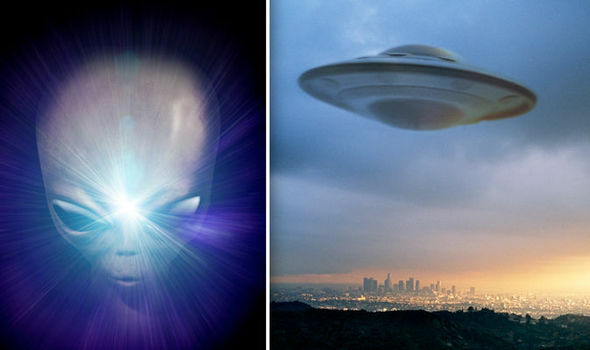 Before we explore why extraterrestrial beings have entered our planet and why they have an interest in human beings, we have got to confirm if ETs (extraterrestrials) and UFOs (Unidentified Flying Objects) really exist. The background information provided below verifies that U.S. military and intelligence agencies conducted clandestine, high secret projects with aerospace corporations that were funded with billion dollar Government contracts to study ETs and duplicate UFO capabilities. The US Government has financed and authorized top-secret projects for the sole purpose of examining retrieved ET beings and investigate their technologies that allow space travel in UFOs. It is therefore certain that ETs do exist and is why we must try to understand the psychological makeup of the extraterrestrial mind and what could be the motivation of ETs to learn about human beings? But as relevant to the American people, there is the need to expose and understand the motivation and agenda of the military, intelligence agencies, and selected scientific and engineering corporations that do not share their ET and UFO findings with U.S. congressional and senate leaders. Long after inception of the top-secret projects, Government leaders, including U.S. Presidents, have not been given access nor accountability of the billions of dollars used to conduct the many unknown, top-secret projects. All covert programs must be revealed to the President of the U.S. and our authorizing Government offices that fund the projects. To be negligent in the surveillance of UFO and ET investigations and activities is to allow power and control to be relinquished to unknown men who can gain control over the earth. After the downing of an extraterrestrial space craft in July 1947 near Roswell, New Mexico, a highly secretive base was constructed in 1951 and identified as Area 51. This base has deep underground tunnels to many different compartmented laboratories where scientists and engineers independently analyze parts of an alien and conduct reverse engineering of UFOs to develop antigravity and use of energy that will permit space travel. UFO built by the US Navy. UFO built by the USAF. Area 51 is off limits to the public and has operated at the highest level of secrecy since its construction in 1947 to the present. The secrecy exceeds that imposed during development of the atomic bomb, which was detonated over the Japanese cities of Hiroshima and Nagasaki in August of 1945. The development of a vast underground secret complex in Area 51 is in the Nevada high desert (5,000 feet above sea level). It’s part of a big parcel of land the US government originally annexed for use in atomic weapons testing. Area 51 occupies approximately 60 sq. mi. and makes up only part of the vast 4,687 sq. mi. of the Nellis Air Force Range (NAFR). Since the beginning of ancient times, a limited number of UFO sightings have been documented and drawn by curious beings. 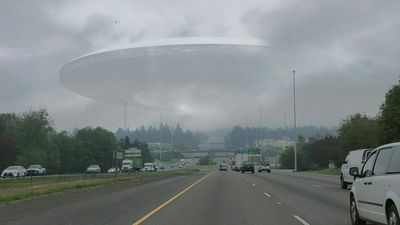 However, with the use of camera technology, hundreds of UFO sightings were reported since the 1500s, and thousands more sighted after the 1900s and continued into the present in the U.S., Russia, England, Mexico, Sweden, France, Italy and other countries. An extensive amount of UFO information is available on the Internet. UFOs manned by an ETs. An exceptionally large UFO hovering over a city. The following link provided by Educating Humanity affords access to: UFO documentaries; pilot, police and mass sightings; forums; interviews with scientists, military officers, and technical personnel who have left Area 51 top-secret projects. The threat of death or harm to family members was given to every top-secret employee if they divulged any ET or UFO information to the public. There are many theories about why extraterrestrial beings are visiting our planet, and many have developed out of fear that these beings will invade earth. Such fear has been propagated by the Military, CIA, NSA, FBI and Government agencies to obtain continued funding for the many underground complexes constructed to covertly study UFOs and recovered ETs. 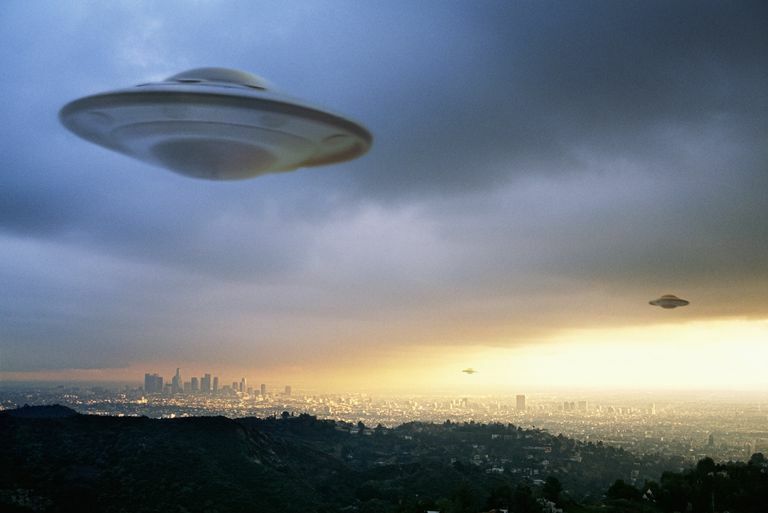 The fears propagated by the military agencies have even affected Air Force personnel to order its military jets to shoot down any flying saucers after sightings were picked up on radar. The UFO sightings were reported by the International News Service (INS) on July 29, 1952, and revealed multiple flying saucers were seen along the East Coast and Washington D.C.
A young Extrateresstrial life form and a UFO manned by Extraterrestrials. The incident of our military giving orders to shoot down UFOs confirms the reality that covert intelligence agencies have been successful to utilize the media to not only alarm the public, but also our military personnel in believing that aliens were a threat to their lives. If there is any threat of war to humans by ETs, it will be very likely to have been initiated by our own military forces. Public fear has been purposely generated by the covert intelligence agencies in order to continue developing their own experimental flying saucers. USA UFOs were successfully operable to impersonate ETs in order to simulate alien abductions. This fear was also fermented by religious fanatics that worked and managed the covert agencies. It is plausible that many of the covert operatives believed that public knowledge of another intelligence from outer space would mean a breakdown of our way of life. Too many people have been indoctrinated with particular beliefs in God and the threat to their belief system could cause panic and turmoil by many religious groups. There may be reason to believe that such highly religious people may be in control of the top-secret UFO ET programs. Possessed by such fears, men in control of the undercover UFO ET projects refuse to share their findings with our Government leaders and the American people. It is clearly evident that military and intelligence agencies, in collusion with large corporations, have deliberately withheld facts about UFO sightings and examination of retrieved ETs, dead or alive, from the American people. UFO under construction by the USAF. Retired officers of the military have reported sightings of UFOs during the 1960s and 70s to their superiors. They informed their superiors that UFOs have disabled many missile sites but they were told not to disclose the incidents to the public. At all levels of covert and secret operations, there was excessive secrecy by U.S. military and government agencies to discount reports by military personnel that their nuclear missile sites were disabled. They deliberately provided false and misleading information to the media, which in turn, convinced the public to scoff and make light of the truth provided by credible personnel as being foolish and imaginary. Consequently, since the 1950s, the media was effective enough to have many people ridicule those who believed in UFO phenomena. Warnings of Secrecy given by Eisenhower and 1st Dir of the CIA. It is apparent that the funded corporations, military, and intelligence agencies worked together to convince Government that contracts were necessary to continue UFO back engineering and scientific ET studies. Their pitch was that such funding was necessary to prevent nuclear war and alien invasion. It has been estimated that covert, unacknowledged, top-secret projects cost tax payers as much as 40 to 80 billion dollars per year. The covert organizers of the UFO ET projects had the scientific objective to achieve antigravity mobility and innovation of new energy to allow interplanetary space travel. Such energy, extracted from space, would make obsolete the use of oil, electric generators, and devices that run on bio fuels. The innovation of abundant space energy would mean a total collapse of large corporations that employ thousands of people and affect the economic and financial balance of world economies. It became apparent that such new technology may cause panic if not taken in baby steps. A UFO developed by the U.S. Airforce. Let us reflect that such technological innovations would mean that poverty in many underdeveloped countries can be solved as the ability to produce energy without complicated mechanical and electrical knowhow is easily achieved. The prize for development of new energy technology would enable the production of human necessities and agricultural products with less cost and material efforts and more time for education of the human mind. It is clear that the American people have been lied to in order to fund covert top-secret projects. When one considers that since 1951, as much as 20 to 80 billion dollars per year has been spent without their Government being apprised of covert UFO ET activities and findings, it is tantamount to fraudulent use of American taxpayer dollars. All of the covert projects could have been accomplished with transparency and truthfulness whereby our Government officials are given reports of the progress made by our UFO efforts and a greater understanding of ET viability. Working in an open environment, the American people would have been exposed to the advancements made in the study of UFOs and ETs whereby, in gradual steps, humans would have become more knowledgeable and accepting of other living life forms. However, large corporations and limited minds, constrained with ingrained ideologies, took control of the covert top-secret programs out of greed to maintain the status quo and possibly attain power with the technologies of anti-gravity and new energy capabilities. Americans, and people in many other countries have the opportunity to use the knowledge gained to manage gravity and space energy whereby they can control their own destiny versus large corporations and small-minded men dictating their future. They must loudly appeal to their leaders in Government to come clean and truly make their country be run by the people and for the people; not the privileged few who only seek to gain power and satisfy their greed. This article is provided to open the eyes, hearts, and minds of people everywhere to stand up to their leaders and no longer be made into fools by lies. The greatest lesson to be learned is that truth can set you free, for anything less, there will only be distorted minds, confusion, and eventually, destruction of mankind and possibly, our earth. How the American People Can Gain Control of UFO and ET Projects. Today, with the access of information on the Internet, Americans are able to become knowledgeable of the fact that covert UFO ET projects have been a reality since 1949. The link below provides factual information to inform Americans of hidden knowledge that top-secret projects have been and still are being conducted by Government agencies and contracted corporations. Beginning with the Area 51 underground complexes, Americans have got to expose the men working incognito, managing UFO and ET projects. Nobody knows who they are, even our own top intelligence and funding agencies do not know the names of the organizers of the top-secret programs who manage the many UFO ET projects. It has been estimated that the CIA, National Security Agency (NSA), National Reconnaissance Office (NRO), and other Intelligence agencies have received the major portion of the black budget and their covert intelligence programs has grown over 100 percent since 2004. Not knowing who are the individuals controlling and managing the covert UFO ET operations, it is obvious that our Government has poured billions of dollars into a black hole with no accountability. Our Government owes the American people accountability of the dollars paid for covert, undisclosed UFO ET activities. To be complicit with funding billions of dollars for covert activities without any oversight is to defraud and cheat the American people of their tax dollars. It was Americans that financed the covert UFO ET projects, which means they are entitled to all of the built complexes and laboratories, including the scientific, engineering and innovative discoveries. In truth, the new technologies developed on the covert projects belong to the American people. It would be wise for all Americans to get their Government officials, starting with the President, to demand all UFO ET facilities, laboratories, technological findings, and new energy development be open and accessible to the public. The argument that it would hurt our defensive and military capabilities is false. To hide scientific knowledge behind the clothe of ignorance and fear forfeits all Americans, and people around the world, from utilizing the benefits of the new technologies that would eliminate poverty and destructive pollution to our earth. The American people can and should gain control of the UFO ET findings and scientific discoveries. To do nothing is to remain sheep and be made into fools. We Need to Understand the Extraterrestrial Mind. The link provided above, Educating Humanity, has revealed that the Disclosure Project has coordinated interviews with over 800 whistleblowers from high level defense contractors, government officials, and military/intelligence individuals to testify the existence of UFOs and ET beings. Facial view of a dead alien. Credible witnesses have come forth to reveal that ETs manning UFOs have disabled hundreds of missiles, but never damaged nor destroyed U.S. missile sites. ET beings could have destroyed them but in reality, it appears they are sending a message to us to be careful with the use of these destructive weapons. They have shown their concern that use of nuclear missiles, intentionally or by accident, can cause not only contamination of the earth but destroy human life. It becomes clear that use of nuclear missiles is regarded by ETs as a threat to human life and our planet. By disabling the firing of nuclear missiles, they appear to be giving a warning to our military forces not to unleash such devastating atomic-nuclear power. One questions why haven’t ETs made personal contact with human beings? We must recognize that the intelligence of ETs is far above that of humans. Certainly, to have mastered technology to traverse millions of light years in space craft that utilizes anti-gravity and spatial energy, their development must be many, many generations, perhaps 100 to 1,000 times that of human life spans. We must understand that ET beings could have destroyed many military facilities with weapons that surpass nuclear, atomic and hydrogen capabilities. But they must have a high respect for the scientific and economic development of many of our civilized countries. They must also be aware of the many countries that are poorly managed with millions of people in poverty. Perhaps, ETs are watching our planet to see if mankind can rise above the many challenges on earth to improve the lives of all people. Surely, they are hoping that human beings can rise above the arrogance, bigotry, and violence precipitated by distorted ideologies. Dead ET with a head wound. Dead ET due to UFO crash. As a visitor from outer space, you would be pleased to see another civilization has advanced to achieve a high level of technology and developed socially to produce literature that allows for continued growth mentally and spiritually. You would like to someday see that another life form has been able to advance and become another friend in the universe to exchange philosophies and ideas. It’s like finding somebody else to play with; like a game of chess to enjoy the intelligence of another mind. It may be that it gets too lonely for ETs to find they are the only living life form in the cosmos. If you were an ET, would you not celebrate to have another life form with which you can exchange ideas and share your history with? Company with another life form is a wonderful thing. Below is a list of ET flying saucer crashes downed by U.S. military weapons through the period 1947 and 1989. The alien bodies are allegedly in the possession of the U.S. Government. For further information about UFOs and ETs the following link is provided. • Open and honest hearings about UFOs and ETs in the U.S. Congress. • That there be a permanent ban on the weaponization of space or the targeting of any objects of ET origin. To initiate such a ban, there must be immediate legislation and national/international treaties to prohibit space based weapons. • That there be a full and complete study of classified technologies connected to this subject to see how they could be properly declassified and applied for peaceful energy generation so that the world may get off of fossil fuels in enough time to prevent eco damage or war over the looming energy crises which is sure to sweep the earth in the coming decade. • There must be declassification and release of currently classified technologies that could ameliorate the environmental and energy crisis. To eliminate poverty, improve the earth’s air quality, and raise the quality of life for all people, we must make use of the anti-gravity and zero-point ambient energy propulsion systems that have already been developed on top-secret covert programs. The easiest way to gain control of all covert UFO ET projects is for Americans, together with Government military forces ordered by the U.S. President, to walk into and take over all top-secret projects. All developed technologies, scientific and engineering documents belong to the American people. There cannot and should not be any select group of powerful people circumventing our system of Government. To allow such a situation is to give up control by a free people to determine the best outcomes for a peaceful and prosperous future. Last edited by Nicholas Ginex on Mon Nov 05, 2018 3:43 pm, edited 1 time in total. How to expose the Coverup?